You can make an outstanding trek in eastern Nepal from either Ktm- Hile – Tumlingtar - Khandbari about 15 hours drive or direct 35 minute flight from Kathmandu airport, you will reach at elevation of 560m. Tumlingtar Airport . Now can 3~4 hrs. grabble road drive from Tumlingtar to Num or Simma Tourist Camp by Jeep. From next day start trekking through Num normal route to direct Makalu BC & optional New trekking trail through Simma Tourist Camp ( Simma village to Makalu Base Camp then circuit trail from Hatiya. One of the major route to upper Arun river origin valley to Tibet China border crossing point Kimathanka. 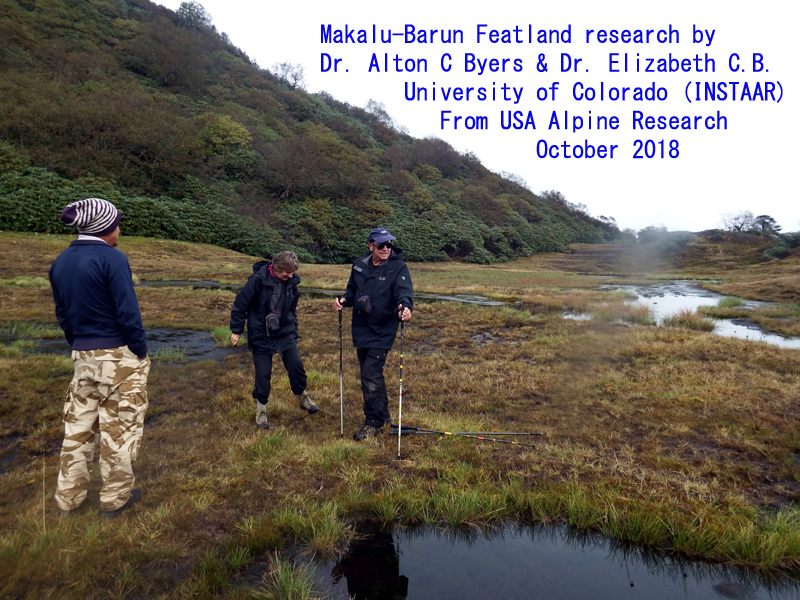 From the new trail route Baule Pokhari (Pond) you can see all eastern Himalayan spectacular panoramic view of above 8000m 5 peaks include Everest Khansung east face and south, north both climbing ridge , Makalu east face and Kangchendzunga. New trail join at Dobate normal route juction. 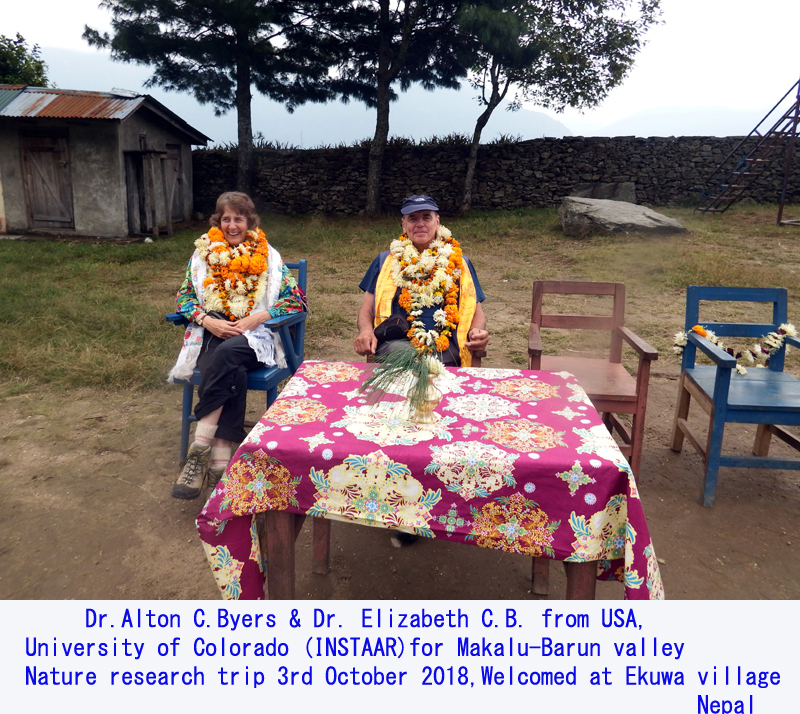 Please look New Makalu-Barun circuit route researched & made google Map by Dr. Alton and Dr. Elizabeth from USA Colorado Unversity' which mentioned detail itinerary in below. For Makalu BC normal route after Arun river crossing, go through Seduwa, then crossing Khongma Shipton La (4216m.) The Makalu- Barun is possible simple Tea-house trek, there are not enough good Lodges management yet. The tourist can find normally local foods. Normally Every day walk 5 – 6 hrs slowly pas during trekking below 3000m elevation, then above shorter walk for acclimatize, some day taking rest at good spot place. Arun Makalu region is one of the remote & very few tourist visited region so far, recently one of the major route up to upper Arun river origin valley to Tibet China border open for tourists for trekking which was restricted for tourists, needed special permit. Now open for normal trekking route.There important Wildlife Flora & Fauna area is protected by Makalu Barun Conservation project since 1992. Now Makalu - Barun National park entry permit fee: 3000. Rupees about USD30 & 1000.Rupees (USD10) TIMS trekking permit per person, which is issue buy authorized Trekking Company. 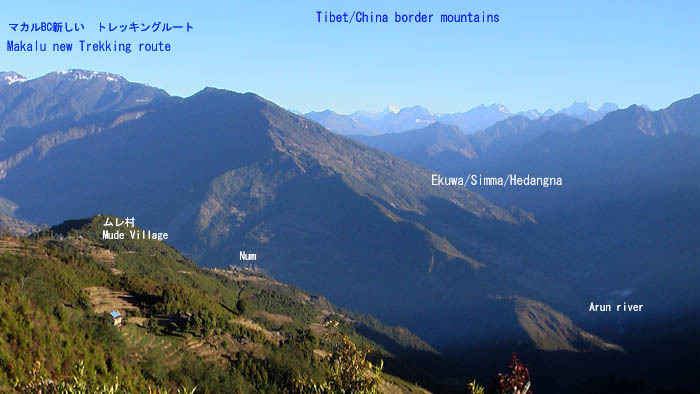 The Makalu - Barun region is the home of mixed of different cast (tribes). There is culture to drink Tongba which is made by wooden pot and filled with fermented millet seeds and boiling water. You can sip through a special bamboo straw, with tiny filters to keep the seeds out of drink. The Makalu-Barun National Park and Buffer Zone is located within Solukhumbu and Sankhuwasabha Districts and was officially gazetted in 1992. It is one of the most wild, beautiful, biologically/climatically/culturally diverse regions in Nepal. Vegetation ranges from subtropical Sal (Shorea robusta) forests at elevations below 1000 m; temperate zone oak/maple/magnolia forests between 2,000-3,000 m; fir/birch/rhododendron forests in the subalpine between 3,000 m to 4,000 m; the herbs, grasses, and dwarf rhododendron/shrub juniper of the alpine pastures between 4,000-5,000 m; and nival or snow and ice zone above 5,000 m. Thousands of kilometers of latitude squeezed into six kilometers of altitude. The 2,330 km2park, which receives more than 3,000 mm of precipitation per year, contains more than 3,000 species of flowering plants that include 25 of Nepal's 30 varieties of rhododendron; 48 species of primrose; 47 species of orchids; 19 species of bamboo; 15 species of oak; 86 species of fodder trees; and 67 species of economically valuable medicinal and aromatic plants. Wildlife include some of the densest populations in Nepal of the red panda, snow leopard, musk deer, barking deer, clouded leopard, Himalayan black bear, wild boar, and serow. Ethnic groups consist primarily of the Rai and Sherpa, with populations of Gurung, Tamang, Magar, Newar, Brahmins, and Chetris in the lower altitudes. Since the 1950s, a number of expeditions in search of the Yeti have been launched in the region, based upon the theory that the rugged terrain and impenetrable forests of the eastern Makalu-Barun region would provide the perfect cover and habitat for a creature not wanting to be found. Aside from a few tracks in the snow photographed by ecologist Edward Cronin in the early 1970s, however, little real evidence for the existence of the creature has been found. 1. Makalu Base Camp ( Arun Valley ) ( By Air ) 15 days to 18 days, 5000m. 2. Arun river Valley up to Tibet Border ( By Air ) 18 days - 21 days, 4127m. 3. Milke danda Trek Along the ridge of Arun valley & Mt. Kanchanjunga 15 days, 3600m. 01 45 minute flight to Tumlingtar 560m. & 5 hours drive to Num or Simma village Tourist Camp 1900m. Tourist Camp. 02 Trek to Ekuwa or Baklek 1200m. 3-4hrs Home stay/Camp. 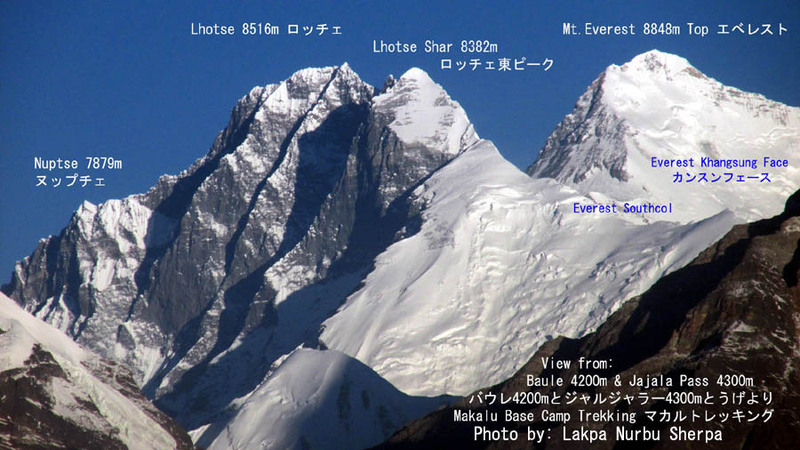 Inquiry for Makalu, Everest east face view & Makalu-Barun National Park circuit New trekking route Welcome..!